ShaCha hot pot is a Taipei favourite. The name ShaCha comes from the Chaozhou ShaCha (沙茶) hot pot flavor - aromatic with a spicy zing to it. 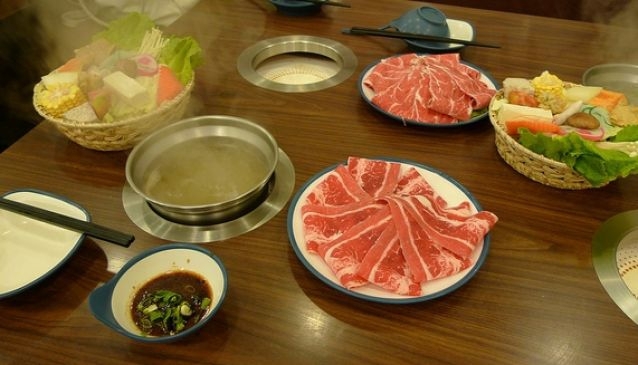 Taipei has an abundance of all-you-can-eat hot pot restaurants. What sets Shui Che Yue apart is the vast variety of freshest ingredients (served on request, rather than out on display). For a seat at the hot pot table, Shui Che Yue charges a set price per person, ranging from $239 - $399, depending on the time of day. For that price, you're granted all you can eat hot pot with endless options meat and veggie options to prepare in your table's own hot pot broth. Drinks and desserts also included! A roomy restaurant, with larger seating areas, Shui Che Yue is a great, affordable choice for families or big groups. Shui Che Yue is just outside of Technology Building MRT station in Daan - the restaurant is on the second floor so look out for a ground floor sign.